Five matches may seem low but this was announced from the start as a two hour show, so time was certainly a factor. Please note that the wrestlers will be meeting with fans after the show until 7 PM, so if you want a picture with the wrestlers be sure to hang around afterwards. If you want more details about any of the wrestlers above that are from Stardom or have wrestled in Stardom before, you can click on their names to go to their profile on Joshi City. Lets take a deeper look at the matches. Since Stardom is using the arena with the assistance of House of Glory, it was only fair that their top two female wrestlers take part in the card. Sonya Strong is the current House of Glory Women’s Champion, a title that she won from her teammate Violette last summer. Sonya hasn’t fully broken out yet on the indie scene but as a four year pro she is one of the next in line and just last weekend wrestled in both SHIMMER and RISE. Her partner Violette is a bit of an enigma as she mostly wrestles just in House of Glory, she began wrestling in December 2016. The Gaijin team face off against the top two wrestlers in JAN (Jungle Assault Nation) – Jungle Kyona and Natsuko Tora. Unlike Sonya and Violette, Kyona and Natsuko have teamed for years and have won both the Trios and Tag Team Championships together. Kyona and Natsuko have a similar level of wrestling experience as Sonya and Violette (3+ years and 2+ years, respectively), however they do have the chemistry and teamwork edge. I’d give JAN the winning advantage here as who knows if Sonya and Violette will even get along, but I suspect the HOG team will do their damndest to impress even in defeat. To get the true Stardom experience, you really need to have a match like this one – a multi-team tag team match. 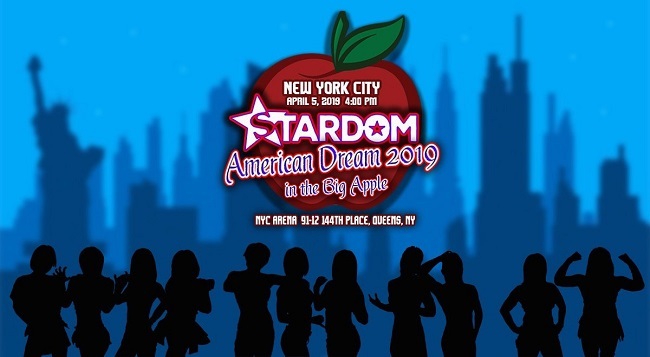 It is normal for Stardom to have events with only five matches, so they are used to finding creative ways to get as many wrestlers on the card as possible. To their credit, these aren’t “random” teams (at least on the Stardom side) as these wrestlers are very familiar with each other. Bea and Konami are both part of the faction Queen’s Quest, which was originally founded by Io Shirai. They haven’t won any titles together yet but have been teaming together when Bea is in Japan since last May of last year. Bobbi Tyler toured for the first time in Stardom in January and regularly teamed with Hana Kimura, so they are friends as well. Brittany and Britt have never teamed together before that I am aware of, Brittany Blake wrestles mostly in the Mid-Atlantic region while Britt Baker recently signed for AEW. My official prediction, based on not much, is Queen’s Quest will win with Konami getting a submission victory over Britt Baker. We have reached the first of two title matches for the event. Hazuki won the High Speed Championship in December and has been a very active champion, with this already being her fifth defense. Anyone that hasn’t seen Hazuki before is in for a treat, she is only 21 but has grown significantly in her skills just within the last six months. Sometimes she gets overshadowed by other members of Oedo Tai, so its great to see her get a chance to impress the American audience in a singles match. Dust, also known as Zoey Skye, is no slouch either and as of the time of this preview has a title in SHIMMER. She also has wrestled in RISE and had a tour in Stardom last summer. While I see Hazuki retaining her title here via pinfall, this will be a really solid midcard match. 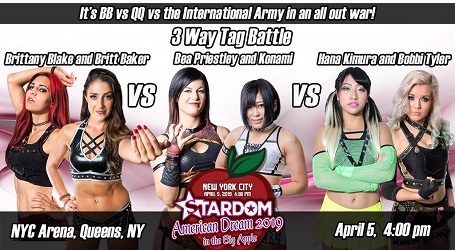 For any Stardom fan, this is the match to see from the event and the reason a bunch of people today quickly created a FITE account so they could order the show. I could type all day about how amazing Utami is for a rookie and how she is primed to be one of the top stars in Stardom for years to come, but then I’d have to type for another day to give Momo her props as well. These are the top two Ace Candidates in Stardom and barring injury/early retirement they will be leading Stardom for many years to come. The champion, Momo, is only 19 years old but a four year pro, she moved up the card slowly but once Io Shirai left she really “grasped the brass ring” so to speak and developed into one of the top wrestlers in Japan. She’s the total package and as she is still growing it is going to be fun to see how much better she will get. Utami Hayashishita just debuted last summer and is the most talented Joshi rookie of the last 20 years, taking Stardom by storm. In just eight months she already holds the SWA Undisputed World Women’s Champion Championship, Future of Stardom Championship, EVE International Championship, and the Goddesses of Stardom Championship, but will she add the Wonder of Stardom Championship? In her first ever singles match against tag partner and primary competition to lead the promotion, can she score the big win? Extremely doubtful. This match is primed to be a Draw, which is an easy way out of having either wrestler lose in their first encounter. 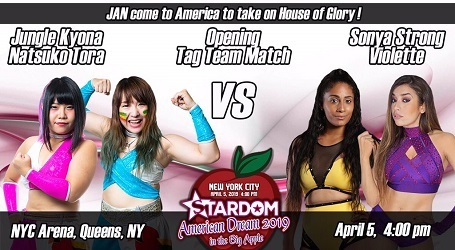 Still, this is a hell of a match and a tremendous offering from Stardom for their American fans, you won’t want to miss this one. Stardom didn’t explicitly announce the card order, however they announced this match last so I am just previewing the matches in the order they were put on Twitter. If this was a regular eight woman tag it would be disappointing as not everyone would get a chance to shine, however it being an elimination match should give all the wrestlers ample opportunity to impress. The match pits Oedo Tai, lead by Kagetsu, against the faction STARS, led by Mayu Iwatani. The chemistry between Kagetsu and Mayu is off the charts and I’m sure they will have a quality segment somewhere within this match, and I wouldn’t be surprised if this match got 25 to 30 minutes. Martina is the weak link here as her shtick can be a bit overwhelming, however with Oedo Tai present the match will likely break down into chaos at some point anyway. 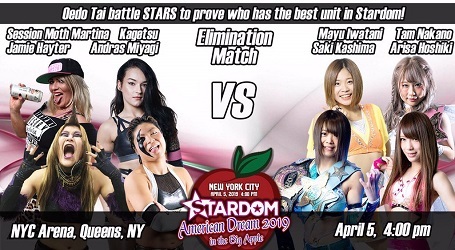 Expect a fast paced match with quick action and quick eliminations, either team could win this but I’ll go with Mayu being the sole survivor for her team and winning the match for STARS. Even with it being a shorter show with only five matches, Stardom is doing their best to satisfy their current fans while also showing new fans exactly what Stardom has to offer. I’ll be watching the show live from the comfort of my home and will have a full show review completed by Friday night. At $9.99, I don’t think anyone will come away from this event thinking they didn’t get their money’s worth, this event has the chance to steal the weekend and any fan of women’s wrestling won’t want to miss it.